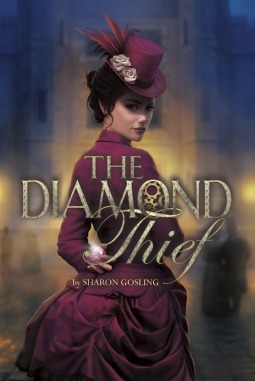 The Diamond Thief is a tale of mysticism, of both the steam-punk and circus variety. It tells of a cursed acrobat, with a taste of thievery and the adventure that ensues when she finds out she’s been duped. This story started off very interesting, so I give it great kudos for "The hook" factor. After a few chapters it just started going in a tailspin of magic gems, talismans, child-labor, all-hell-breaks-loose-then-is-contained-again, insta-love antics. It just felt all over the place, plot-wise. As usual, I didn't enjoy the insta-love that could be seen a mile away, and it really made me cringe when I remembered it involves Rémy 16 years old girl, and with Thaddeus being a policeman at Scotland Yard... uh... yeah. I must say that I do admire Rémy's determination and independence. The overall characterization of the different people in the story could have been more in depth, but the author did a great job with setting the different scenes. Although quite a few aspects of the story seemed a bit absurd (for example, the accusation of Thaddeus Rec, by his comrades,) this book feels like it would appeal to a younger crowd, such as the middle-grade genre. It’s a quick read and is full of mystical adventures.